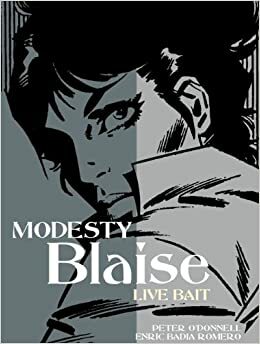 Modesty Blaise is a fictional young female character featured in a British comic strip created by Peter O’Donnell and Jim Holdaway. 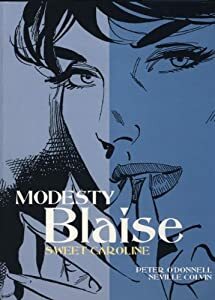 The comic pursues the exceptionally talented and criminal Modesty Blaise and her sidekick Willie Garvin through a series of enthralling and exhilarating events. Created in 1963, the comic was so successful it was later adapted into films in 1966, 1982 and 2003, followed by one graphic novel in 1990 and thirteen novels and short stories produced in 1965. The latest adaptation of the comic is a series of wall murals released in 2012 featuring the two characters. The 1966 film adaptation was categorically placed as a comedic spy-fi motion picture taking inspiration from the surrealist comedy-adventure cinematic trend of that time. 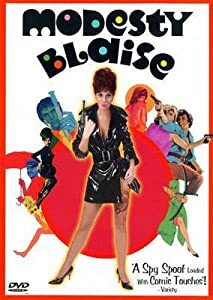 The film is loosely based on the comic strip and sees Modesty Blaise, a former crime boss, recruited by the British Intelligence to put a stop to a diamond theft operation. The recruitment brings about conflict with other characters and sees the protagonist reunited with her accomplice. The noticeable differences for dedicated fans, in comparison to the comic strip, are Modesty’s hair colour, Willie’s hair colour and their romantic relationship that develops into marriage. Their relationship is the most significant difference as Peter O’Donnell set out to never allow romance to blossom between the two characters. 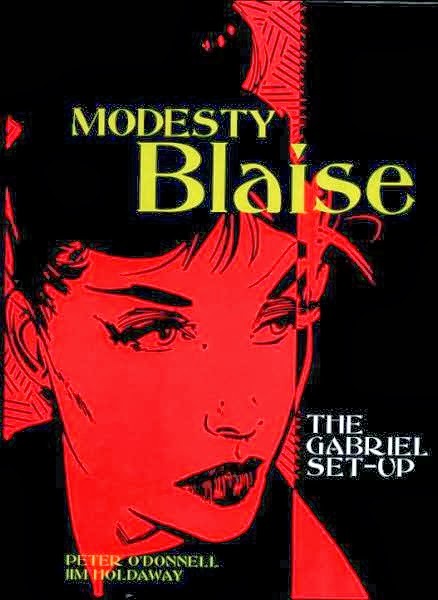 Interestingly, the film includes a metafictional detail where the Modesty Blaise comic strip is featured on several newspapers in a characters apartment suggesting that the comic and film adaptation existed in two different time periods. The film was recognised with great success and is now categorized as a camp-classic. 1982 saw the release of another more serious adaptation of the comic strip. Set in LA, Modesty and Willie help prevent a young girl from being kidnapped. They learn the girl is a computer genius and her skills are being utilized by the US secret service to build a super-computer which is then stolen by an enemy to make a killing on the N.Y stock exchange. Modesty and Willie naturally save the day. Another reasonably successful adaptation given the characters contrast greatly to the comic strip characters. The final film, My Name Is Modesty, was released in 2003 and focuses on Modesty alone without her trusty sidekick. The plot reveals her casino employer is targeted for assassination by a group of criminals who seek the password to a safe. Whilst awaiting on the arrival of another character to supply the criminals with the password, Modesty agrees to play roulette and share her life history should she lose. Fans get to witness the characters childhood up until the present moment. Whilst the 1982 and 2003 adaptations didn’t receive critical acclaim, the 1966 film proved successful receiving a BAFTA nomination for Best British Cinematography and a Cannes Film Festival nomination for the Palme d’Or. Although the Modesty Blaise team lost out to The Ipcress File and A Man And A Woman, being considered for the award is an achievement in itself. Despite the differences in character traits and plot, compared to the comic, the 1966 adaptation was a huge success with its audience. The 46th year since the film’s release sees a collection of art work paying tribute to Peter O’Donnell’s comic strip suggesting the characters will remain ever popular with their fans.